If it's important to you to make every workout count, the Fluid2 trainer is the most valuable weapon you can add to your indoor training arsenal. New Resistance Unit Clutch know ensures optimum tyre/spindle engagement every time you ride! CycleOps engineers designed the Fluid 2 to capture real road feel through the use of a 2.75 lb individually precision–balanced flywheel for more momentum and stability of your rear wheel. They also adjusted fluid levels for better resistance and improved the position of sealed–cartridge bearings for better inertia and an ultra quiet ride that ensures increased wattage as you increase your speed. And just like riding outside, simply shift gears to increase or decrease resistance. When you spin your wheels on the Fluid2 it feels like you're actually getting somewhere. Stop logging junk miles and start employing the exclusive PowerTuned technology—the result of scientific and athletic collaboration. Now riding the trainer feels more like riding on the road because your wheel accelerates and decelerates on an infinite resistance curve, just like it does outside. Professional cyclists and renowned scientist Allen Lim worked together to develop a power curve based on a hybrid of road and time trial positions, finding the point at which a speed of 25 mph overlaps with an output of 400 watts. 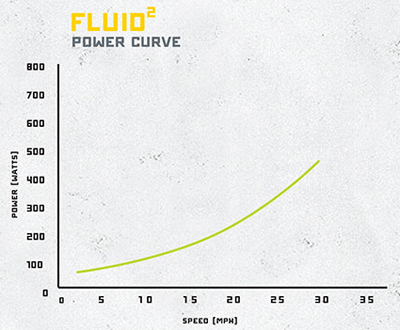 This point of overlap is where the optimal power curve resides and is the basis for PowerTuned technology. By training on a PowerTuned curve, you benefit from the most true-to-life speed verses power contingency, no matter what speed you ride at. CycleOps Fluid 2 Trainer is rated 4.6 out of 5 by 633. Rated 3 out of 5 by Justin from Product started leaking after first use. I read the reviews and settled on this trainer, in the hopes that it would serve me well in the darker months. After the first use, only putting 17 miles on the unit, it's started leaking. No response from the company after reporting the issue. Rated 3 out of 5 by N/a from Need Response in regard to Warranty - Product is fine Easy to use and set up. Do I need the adapter for my size of wheel? It will work fine with your wheels without an adapter. The trainer comes with all the basics that you need to use it, including a specific quick release for your wheel. i read on the internet that cycleops are compatible with zwift as an online trainer is this version capable? This trainer should be suitable. How high is resistance on this trainer? What is the max wattage? The Fluid trainer offers the widest range of progressive resistance. Spin along with virtually no resistance or hammer out a 2000-watt sprint. You will never outgrow this trainer. Includes Cam Lever for easy adjustment of resistance unit. Can this be used with an Alfine 11 hub? I have an Avanti Inc 3 which has an Alfine 11 internally-geared hub. Does this cycle trainer require a custom skewer? If so, I don't think it is compatible with an internally geared hub - is that correct? The previous answer confused me somewhat: &quot;Unfortunately it will not be possible to use a Alfine 11 equipped bike with a turbo trainer I am afraid.&quot; I've emailed a few of the manufacturers and so far Kurt Kinetic have replied and confirmed that the standard fittings do work with Alfine 11 hubs (one of their partners have been using them for some time). Also, I believe Tacx provide some replacement nuts to allow their trainer to be used with the hub. So it cannot be that _all_ trainers are incompatible with the hub. Could you please clarify what the previous answer meant? The left bolt needs to be adjusted - but how? The manual says pull and twist, but the unit is so tight this is impossible. Am I missing something? With this trainer on the left hand side you will have a ring with the guide/holder of the quick release. This can be adjusted by being unscrewed in order to centralise the bike. If you require further help then please let us know using the contact button above. I want to take the unit abroad with me. It's much easier to transport unassembled, but I want to make sure I know it works and works with my bike before I travel. Can the unit be easily disassembled after it's been assembled, or would you not recommend assembling it until I'm overseas? The Cycleops Fluid 2 trainer can be easily assembled and unassembled so you will have no issues trying this before leaving for overseas. Hope this helps. What size and weight of box?